Your pet rats will spend most of their life inside of their cage, so it’s a good idea to do your research to ensure you are giving them the best home you can. 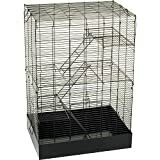 Pet rat cages don’t need to be an expensive purchase, but they do need to meet safety and size requirements. 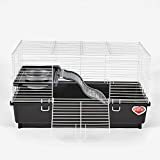 There is a lot of think about before buying your rats’ cage, so we’ve narrowed down the basics of choosing a rat cage and compiled the top 5 best rat cages for your pet. The size of cage you’ll need to buy depends largely on the number of rats you plan to house together. More rats = larger cage. A common guideline used for rat cage space is a minimum 2 cubic feet per rat. 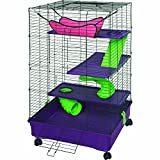 If your budget is flexible, you should try to get a cage that exceeds this guideline to ensure there is enough space to accommodate their lifestyle and cage accessories. Rats might be small animals, but they need ample room for playing, sleeping, and getting away from each other from time-to-time. To find out if the rat cage you’re interested in purchasing is the right size for your rats, you can find free rat cage calculators online. They’re simple to use, you just input the cage measurements (inches) into the calculator, and it will tell you how many rats can be housed together comfortably. The type of material your rats’ cage is made from can have a serious impact on their quality of life and how easy the cage is to maintain. Coated metal wire cages are preferred by most rat owners because they’re chew proof and allow for good ventilation. Look for cages with a solid base or removable plastic tray – they are easier to clean and safer for your rats’ sensitive feet. Wooden and plastic cages should be avoided because they don’t provide adequate ventilation and ammonia build-up is difficult to remove from these surfaces. Rats are flexible and can squeeze through some tight spaces if they are determined enough. A good rule of thumb is, if a rat can fit their head through an opening, the rest of their body can fit, too. For female and young rats, the recommended spacing on rats cages is between bars is ½” or smaller. This spacing is suitable for climbing but will be too small for most rats to escape. Larger male rats can be in cages with 1” or smaller bars without much difficulty. It’s important to confirm wire spacing before purchasing your rat cage because some cages might be recommended for rats but have slightly larger spacing between bars making them unsuitable for babies or smaller adult rats. Rat cages can be quite heavy, especially if you have multiple rats and follow the recommendation of getting a metal cage. For ease of mobility, look for cages that have wheels attached to the base. This will make moving your rats between rooms and sweeping loose bedding an easier task. Another consideration to think about for rat cages is how easy it is to assemble the cage. Some cages have more complicated instructions than others and may even require some basic tools for assembly. To get an idea about tough it might be to build the cage you’re interested in, look at customer reviews or do a quick Google search. When it comes to cage cleanings, reorganizing accessories, and interacting with your little pals, accessibility is a very important feature you don’t want to overlook. A rats cage with a large door is preferred because it will help you retrieve your rats quickly during emergencies, hang water bottles and other accessories, and have easily access for thorough cleanings. Rats are natural climbers, so they will appreciate a cage that offers multiple shelves to climb and explore. Additionally, shelves help fill space that would otherwise be empty and unused because there would be no way for your rats to use it. In addition to shelves, you can use hammocks, hanging tunnels, or accessories like the Lixit Space Pod. This is one of the most popular rat cages available, and for good reason! You can get it in two sizes, single or double, and there is the option of buying an add-on level if you want to add more space. The different levels encourage climbing and exploring. This cage is another popular choice amongst rat lovers. It’s affordable, and incredibly spacious, and includes two platforms, three ramps, and a hammock. Kaytee Multi-Level Habitat w/Removable Casters, 24" x 24" x 41.5"
This cage has a cute design and comes with ramps, a tunnel, and a spiral slide. While it’s not the cheapest option on the list, it is a fair price for the size. This cage has different levels and shelves to explore and ramps to climb. It’s another good option if you don’t have a significant amount of room at home. It’s not the highest quality cage available but with some slight modifications, it will be a good home for your rats. This smaller cage is a good option if you only have two rats and you don’t have a lot of extra space. It’s affordable and has three levels with stairs so there is still room to explore and play. Although you might see them used in television shows or movies, aquariums are not a safe home for your mischief. You shouldn’t use an aquarium because they provide poor air circulation; a dangerous trait for an animal who is susceptible to respiratory infections. Additionally, your rats can’t climb the walls of an aquarium like they would a wire cage. This eliminates some potential play/exercise and usable space. It’s true that some hamster cages are nice to look at, but they are not a practical choice for pet rats. Not only do they provide poor ventilation like an aquarium, they aren’t large enough for any number of rats to live in. Additionally, some hamster cages have tubes or other accessories that connect to the cage that might be nice for hamsters, but rats will likely get stuck in them. Choosing the best rat cage for your mischief can be a tough decision, but with the help of our cage guide and calculators designed to help you out, you should have no problem finding the perfect home for your pet rats.